MeeGo released a important core update for netbook users on Monday. The new updates fixes lots of bugs and makes the OS all the more stable. 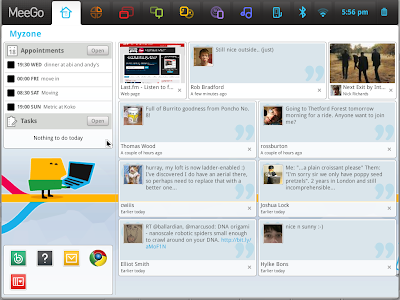 MeeGo is a collaborative project from Intel and Nokia. MeeGo is an open source, Linux project which brings together the Moblin project, headed up by Intel, and Maemo, by Nokia, into a single open source activity. MeeGo integrates the experience and skills of two significant development ecosystems, versed in communications and computing technologies. MeeGo provides expanded features, improved performance, and a richer user experience for netbooks. With its advanced support for touch and connectivity, MeeGo is a compelling platform for netbook and tablet creation and application development. MeeGo is a light-weight, scalable, fast-booting and a brand-able operating system. This update is recommended for all users running MeeGo 1.0. It includes general operating system fixes that enhance the stability, compatibility, and security of your devices. This will upgrade Meego 1.0.1 to Meego 1.0.2. Existing users will receive update notifications. If not go to Applications>System>Upgrade. New users can download the first MeeGo release and then run the update process to get to the current version.